When Nestle’s Nespresso machines came out with espresso capsules, it was nothing short of a miracle. Compared to the big, hot steamy machines of old, we now had the option of a sleek little machine with coffee capsules that packed a lot of punch in a single-pod, perfectly-sealed portion. These capsules promised to keep the coffee fresh and the flavour in. Who would have thought that this would work in the first place, never mind take off? Or that just about every household would soon have a machine on their kitchen counter? Since then, various versions of these instant coffee machines have popped up, including Keurig, Krups, Russell Hobbs and DeLonghi, but they all work on exactly the same capsule-brewing concept. At first, there was only a choice of different types of coffee. A large-enough range of 16 different flavours and coffee varieties from dark roast to decaffeinated – each variety from a different country with flavours to match, from the mild to the strongest or bitterest, all depending on your taste and preference. Then the capsules started venturing out into flavours like vanilla blossom, chocolate vanilla, cherry dark chocolate, caramel vanilla, coconut, macadamia nut, hazelnut chocolate, toffee, vanilla and orange chocolate to mention a few. With these capsules becoming a staple of the average family’s diet, the demand for new flavours continued to grow by the day. So where to from here? A rabbit out of the hat moment! 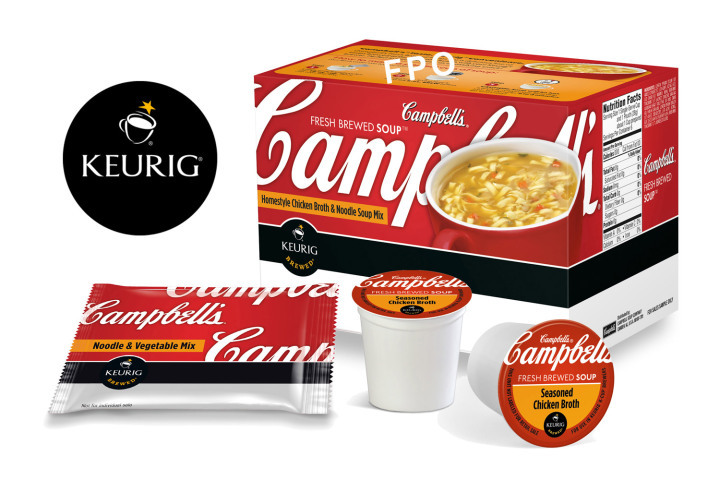 Campbell Soups has partnered with Green Mountain Coffee Roasters to bring out K-Cups for Keurig. So instead of espresso coming out at the other end of your machine, you’d be pouring yourself a freshly-brewed cup of chicken soup, perfectly seasoned for that extra boost you need in winter. But how would this be different from just heating a portion of Campbell’s soup in the microwave? Perhaps it’s just about the convenience of a single cup serving, using a device we all have at work or home, or both? Perhaps it’s all just gone one step too far. But then that’s what coffee purists said about the espresso capsules in the first place. So perhaps this is the future of convenience food. Who knows?